In addition to the V360, which leaked the other day, Acer is working on another Android smartphone. The Acer V350 was spotted on GLBenchmark – a place where many yet-unannounced devices are often discovered, by the way, so we believe we know what kind of handset we are dealing with. Judging by its hardware specs, the Acer V350 (or whatever its market name turns out to be) will be an upper mid-range device. It might also end up being the maker's flagship for at least the first half of 2013, unless an even more capable device is in the works. There is a dual-core Snapdragon S4 chip powering the Acer V350, namely the popular MSM8960 running at 1.5GHz. The screen on the smartphone has a resolution of 1280 by 720 pixels, but we don't yet know its physical size. 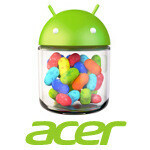 It is also worth noting that the Acer V350 runs Android 4.1.2 out of the box. The GLBenchmark database entry for the Acer V350 does not reveal much more, but we should have all the spicy details announced in the near future. If the smartphone is meant to land on the market, it will probably be announced either at CES in January or during MWC a month later. the performance may be good due to the s4 pro chip,,but it depends on the size of the screen and internal memory,,if its a 5 incher or above it should sport a 1080p display to compete with the droid dna and upcoming models like sony yuga,etc,(if its near about 4.5inches then 720p would be sufficient)and also it should have minimum 32gb internal memory if acer launches it without a micro sd slot.after a couple of months,all top of the line premium smartphones will rock 1080p displays..Also keep in mind after sales service back up and availability of parts and hardware components is an issue with acer in some countries. It's the S4, but I'm pretty sure it's not the Pro. Eh, I know that most people would want “comparable” features, but the HD screen is a little overkill for a 5-inch screen in my opinion since it is still small enough that the difference is undetectable to the human eye. I like the HD screen on my Note II though but I haven’t compared it to a non-HD 5.5-inch screen. I’m happy with my Note II that has all of the bells and whistles, but as my DISH coworker points out, I don’t really need them. I know that even though I watch a lot of TV with my phone and DISH Remote Access app that I can get along with a much less powerful phone, but I like the large screen. The Sling Adapter I have at home sends the TV through the internet and I pick it up on my Note II or iPad at work or on the go, which helps me watch more TV than I used to watch.